Take a ride along the banks of the Mississippi River, pull up a stool in any St. Louis blues joint and talk will soon turn to the musician who's giving the city it's soundtrack. Jeremiah Johnson's towering reputation has been hard-earned. During a two-decade rise, his triumphs have been accompanied by struggles and scars - not to mention the solitude of a life in motion. But those hard knocks have forged him as an artist, and now they feed into Straitjacket: the warts-and-all masterpiece that gives it to you straight. 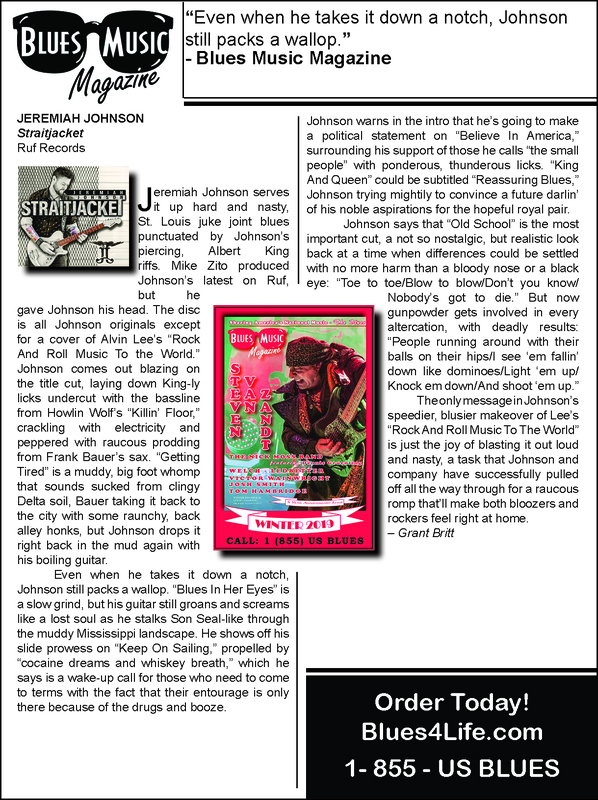 "This album is original American rock 'n' blues with southern-fried soul," explains Johnson. "I just close my eyes and feel the music go through me..."
Few are better-qualified to commentate on modern America's melting pot of people, cultures and musical genres. As Johnson reminds us in the autobiographical groove of 9th & Russell, the bandleader cut his teeth in St. Louis, then honed his craft in Houston, where he won the Regional Blues Challenge for three years running. But it was the return to home-turf in 2009 that truly planted Johnson's flag, as he hit the stage at the iconic Hammerstone's blues bar and spliced the two cities' musical palettes into his own searing original material. Since then, there's been victory in the 2011 St Louis Blues Society Challenge, acclaimed albums including 2014's Devon Allman-produced Grind and 2016's genre-hopping Blues Heart Attack - not to mention the Ride The Blues documentary that painted a candid portrait of Johnson's bitter-sweet rise. In 2018, Straitjacket wears his soul on it's sleeve. Produced by Mike Zito, and tracked live by the crack-squad studio band of Frank Bauer (sax/vocals), Benet Schaeffer (drums) and Tom Maloney (bass), the tracklisting takes in plenty of playful moments, like the title track's hectic funk-blues complaint to a controlling girlfriend, or the grooving Dirty Mind, about a lover calling up for "a little company" at 2am. But elsewhere, personal songs like the addiction-themed Keep On Sailing bleed into the social commentary of Believe In America and Old School, which examines the spate of US shootings. It all ends with a cover of Alvin Lee's classic Rock 'N' Roll Music To The World, which sees the band flex their astonishing chemistry and enjoy the ride. The man himself hopes you will do the same: "I want people to let this record play from the first to the last note, crank it up at a party or riding through the night on a Harley-Davidson. I want it to make people feel like going on a trip of emotion..."